With the best selling phone on Amazon in 2018, Lenovo had big shoes to fill when making the successor of the Moto G6. Fortunately, Lenovo was up to the task. The Moto G7 continues to provide a high performance-to-price ratio, offering a worthwhile upgrade for G6 users while remaining budget friendly. The Moto G7 is about 50% better in overall performance than the Moto G6. While we can't predict if this phone will top its predecessor on Amazon, we can confidently say it will challenge the 2018 model thanks to a once again strong showing. While there are only a few changes, they are major ones which users will notice right away. The Moto G7 brings the G series to the midrange class. The G7 has a much improved SoC over its predecessor, along with a larger screen. 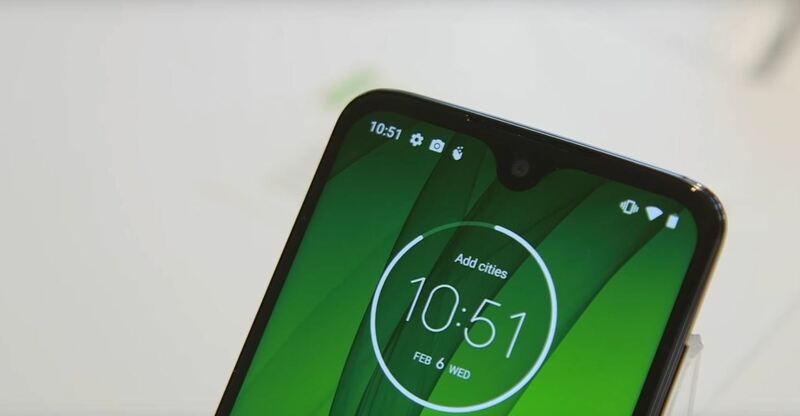 It's also one of the cheapest phones to run the latest version of Android (9.0 Pie), with the only cheaper model at the time of this writing being its sibling device, the Moto G7 Play. The Moto G7 was announced on February 7, 2019. Pre-orders start February 22, 2019, with its official release on March 7, 2019. It will be available unlocked at Best Buy, B&H Photo, Walmart, and Amazon. It will also be available directly through Google Fi, Republic Wireless, and Ting. The Moto G7 comes with one storage option of 64 GB. It also supports microSD for expandable storage, up to 512 GB. The Moto G7 will retail for $299. Currently, we don't know the price of Moto Care Protection, as it isn't revealed until the phone's release. The back cover is a "3D glass back." It is protected by Gorilla Glass 3 on the back and front. The frame is aluminum, giving much needed durability. It comes in two colors: Ceramic Black and Clear White. The G7 is both taller and wider than its predecessor thanks to a larger display. However, it is a bit thinner (0.02 in), which should help it feel smaller in the hand. It is also 0.18 grams heavier. Just like its predecessor, it is coated with a P2i nano-coating, which will make the phone splash resistant. This translates to the G7 surviving light rain, a little bit of sweat or water, but nothing more. Once again, the G7 will be SIM-unlocked and compatible with both T-Mobile and AT&T network. Lenovo will also release a variant on Google Fi, Republic Wireless, and Ting. The Moto G7 is running the latest version of Android, 9.0 Pie. It is also essentially stock Android, with the exception of a few features and apps such as Moto Display. With 9.0 Pie, the G7 is the second-cheapest phone to release with the latest Android version (the cheapest being the upcoming Moto G7 Play), making it a great way to familiarize yourself with the new update. Motorola devices run a version of Android so close to stock Android, it is unfair to call it a skin. Motorola doesn't give it a name. With the exception of Moto Display and few gestures and shortcuts, it is a very similar experience to a Google Pixel device. Besides the SoC, the biggest improvements to the Moto G7 is the screen size. The G7 has upgraded the 5.7-inch screen from the G6 to a 6.2-inch powerhouse. With such a large screen, it becomes a potential candidate for the best budget phone for streaming movies. The only negative of the screen is the display notch, although it uses the teardrop styling for minimal size. The G7 has a resolution of 2270 x 1080, giving it a respectable 403 ppi pixel density. The biggest difference Moto G6 users will notice is the much improved SoC in the G7. Unlike its predecessor, the Moto G7 is using a true midrange chipset, the Qualcomm Snapdragon 632. While this isn't the best 600 series SoC, it is noticeably faster and more efficient than last year's Qualcomm Snapdragon 450. Gaming is also much better thanks to the upgraded GPU. Motorola is keeping the phone at 4 GB of RAM, an amount that is more than able to handle Android 9.0 Pie (this is also the same amount of RAM that the Google Pixel 3 and 3 XL have). At 3000 mAh, the battery capacity is the same as last year's G6. However, with the more efficient SoC, users should see better battery life. And charging this battery is the 15W TurboPower system, which Motorola claims will provide 9 hours of usage after 15 minutes of charging. The front camera is once again 8 MP. It lacks a dedicated flash, instead relying on the screen. It is capable of Portrait Mode, Auto HDR, Auto Smile Capture, and much more. Once again, the Moto G7 will have a dual rear camera system. The G7 sports a 12 MP main shooter and a 5 MP depth sensor. Unfortunately, neither lens has optical image stabilization. There is no optical zoom, but digital zoom up to 8x is supported. There is also built-in Google Lens integration so you can learn more about objects in your viewfinder. As for its video performance, the G7 can shoot up to 4K at 30 fps. It is capable of slow-motion video, limited to 120 fps at 720p. Thanks to Dolby Audio, you have even more control over the sound performance of the G7. There is also 1 receiver and 1 bottom ported speaker. And before you ask, yes the headphone jack is still there. There are no glaring omissions or inclusions when it comes to sensors. Expect the usual assortment that you find in most smartphones. GPS is the same as the sensors. No glaring omissions or inclusions to be found. Wi-Fi is limited to 802.11n (aka Wi-Fi 4), which is a bit disappointing, as 802.11ac (aka Wi-Fi 5) is pretty common now. Bluetooth is also limited to 4.2 LE instead of 5. Audio is also limited to aptX and not aptX HD. There is also no NFC, so those use Google Pay are out of luck. Since the Moto G7 is sold SIM-unlocked, it has all the bands for both T-Mobile and AT&T. However, because it is also will be sold through Google Fi, it does have CDMA bands for when it needs to switch to the Sprint network. A rear fingerprint scanner is available for biometrics-based authentication. You can use face unlock, but it is less secure as it works using the front-facing camera, which makes it easily fooled by a picture. In the box, you will receive the phone, the TurboPower fast charger, a USB-C cable, a SIM tray ejector tool, and guides. How To: Play the ukulele chord progression in "C"